Something about plants makes a space feel fresher and more alive, and our selection is the freshest around. Wandering Jew houseplants are fast growing, easy care plants that are perfect to hang in front of a window that gets bright indirect light. The Zebrina variety of the Wandering Jew Plant has long vines covered in small stemless leaves about 2” in length. 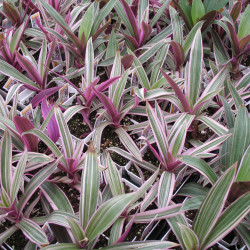 The colorful zebra patterned leaves of the Zebrina Wandering Jew Plant are green with purple stripes and a silver shine. The underside of the leaf of a Zebrina Wandering Jew Plant is a deep purple or magenta color. There are other types of Wandering Jew Plants that may have pink, off -white, or bronze stripe in their leaves. The Fluminensis variety of the Wandering Jew Plant has small solid green leaves and white flowers while the Palida variety of the Wandering Jew Plant has purple leaves with white, purple, or pink flowers. Wandering Jew Plants, native to South America and Mexico, are commonly used in the Tabasco region of Mexico as a cold herbal tea called Matali. LIGHTING REQUIREMENTS: Wandering Jew Plants like bright indirect light. The better the light, the more flowers and colorful leaves a Wandering Jew Plant produces. Direct sun causes the purple and cream colors in the leaves of a Wandering Jew Plant to fade. CARE INSTRUCTIONS WATER: Water a Wandering Jew Plant well and then allow the top 2 or 3 inches of soil to dry out before watering the plant again. If the soil of a Wandering Jew Plant stays too dry and the plant is in bright light, the leaves of the Wandering Jew Plant become stunted the leaves lose color. FERTILIZER: Feed a Wandering Jew Plant monthly, when the plant is growing, with a water-soluble houseplant food at 1/2 the recommended strength. Using a plant food high in nitrogen helps a Wandering Jew Plant produce more colorful leaves. Over- fertilizing a Wandering Jew Plant is another reason why the bright colors in the leaves start to fade. TEMPERATURE: A Wandering Jew Plant grows well in temperatures between 60-80 degrees. HUMIDITY: Average to higher household humidity is best for a Wandering Jew Plant. If the air is too dry, the leaf tips of a Wandering Jew Plant burn and turn brown. You can place a Wandering Jew Plant on a tray of wet pebbles to increase the humidity around it. FLOWERING: In ideal growing conditions, a Wandering Jew Plant produces small white, pink, or purple flowers. PESTS: Although Wandering Jew Plants are fairly pest resistant, Aphids, scale, and Mealy Bugs can be a problem. DISEASES: The high humidity Wandering Jew plants prefer encourages fungal and bacterial infections. SOIL: The soil for a Wandering Jew Plant should be well- aerated soil that drains quickly. If the soil in the pot of your Wandering Jew plant seems too heavy and clay-like, add some peat moss and perlite. I have to admit that Majesty Palms are not my favorite indoor plants. They are a challenge to take care of and are not very forgiving. Majesty Palms, native to Madagascar, do extremely well in rain forests, swamps, or outdoors in places like Florida. Indoors Majesty Palms often struggle to survive and rarely do as well as a Bamboo Palms, Neanthebella Palms, Kentia Palms, or Rhaphis Palms. Majesty Palms, or Ravenea Rivularis, are large inexpensive plants that look good when first purchased but often quickly decline. If you’re not easily frustrated and really want to test your plant skills, you might want to give a Majesty Palm a try. LIGHTING REQUIREMENTS: A Majesty Palm needs very bright indirect light at all times. One of the reasons the fronds of a Majesty Palm turn yellow is that there is not enough light. CARE INSTRUCTIONS WATER: The soil of a Majesty Palm should be consistently moist but not soggy. Never let a Majesty Palm dry out or sit in water. Brown tips on a Majesty Palm means the plant needs more water and yellow tips mean the plant has been over-watered. FERTILIZER: A Majesty Palm requires a great deal of fertilizer. Not enough plant food is another reason why a Majesty palm gets yellow leaves. Feed a Majesty Palm every two weeks when the plant is actively growing with a balanced houseplant food at 1/2 the recommended strength. TEMPERATURE: Majesty Palms do well in temperatures between 45-85 degrees. Try to keep this Palm away from cold drafts or heating vents. HUMIDITY: Majesty Palms do best in high humidity, but can grow well in basic household humidity. PESTS: spider mites are the main pest problem for Majesty Salms. Spray the fronds of a Majesty Palm with warm soapy water to prevent spider mites. If spider mites do appear on your Majesty Palm, treat the plant with Neem Oil or Safer insecticidal soap. DISEASES: The high humidity that a Majesty Palm requires encourages bacterial fungal infections. Keep the leaves of a majesty palm dry and provide good air circulation around the plant. SOIL: Use a rich soil that drains well for a Majesty Palm. If using a basic houseplant mix for a Majesty Palm, try adding some sand. A Lucky Bamboo Plant is really made up of the cut stalks of a Dracaena Sanderiana plant and is native to West Africa and Eastern Asia. These Lucky Bamboo Plant stalks are usually between 4″- 24″in height. Followers of Feng Shui believe that Lucky Bamboo Plants bring prosperity and good fortune to a home or business. If a Lucky Bamboo Plant arrangement has three stalks it brings happiness, five stalks bring wealth, and six stalks bring health. Four stalks are never allowed in a Lucky Bamboo Plant since the word four in Chinese sounds too close to the Chinese word for death. If you buy the Lucky Bamboo Plant stalks loose and not planted, be sure to keep them in water until you have permanently placed them in a vase or decorative container. 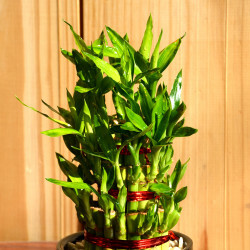 If you purchase multiple Lucky Bamboo Plant stems that are tied together, do not remove the ties, this stabilizes the plant. Lucky Bamboo Plants require very little care and grows practically anywhere as long as you keep the water clean and chemical free . LIGHTING REQUIREMENTS: A Lucky Bamboo Plant survives in low light but does better in medium indirect light. Pale leaves indicate a Lucky Bamboo Plant is not getting enough light. Avoid placing a Lucky Bamboo Plant in the direct sun. CARE INSTRUCTIONS WATER: Watering a Lucky Bamboo Plant takes a little time and care. Keep the marbles and pebbles in your Lucky Bamboo Plant vase covered with water at all times. Add water to the Lucky Bamboo Plant container weekly to keep the proper level. Once a month remove the Lucky Bamboo Plant from the water, rinse the roots, pebbles, and marbles with fresh water, and then put the arrangement back together. Avoid using water high in fluoride or chlorine. FERTILIZER: Fertilize a Lucky Bamboo Plant monthly in the spring and summer with an African Violet plant food at 1/2 the recommended strength. Excessive fertilizer causes the leaves of a Lucky Bamboo Plant to turn yellow. TEMPERATURE: Lucky Bamboo Plants do best in warm temperatures between 70-85 degrees. HUMIDITY: Basic household humidity is fine for a Lucky Bamboo Plant. FLOWERING: A Lucky Bamboo Plant produces flowers that only appear at night. The blooms of a Lucky Bamboo plant are made up of many small flowers and have a slight scent. PESTS: A Lucky Bamboo Plant attracts unwanted insects if placed outdoors but is pest resistant indoors. DISEASES: Lucky Bamboo plants are prone to fungal infections that turn the stalks yellow and cause the stalks to die. SOIL: Lucky Bamboo Plants can be planted in a loose quick-draining soil as well as kept in a vase of water. If using soil always allow the top few inches to dry out before watering a Lucky Bamboo Plant. ZZ Plants (Zamioculcas Zamiifolia), are beautiful, unique, almost impossible to kill succulent-type houseplants that burst onto the market a few years ago. They have become an immediate hit. ZZ houseplants have long stems covered in hundreds of round, plump, shiny green leaves (or leaflets as they are called). Zamioculcas zamiifolia, native to Eastern Africa, are very drought resistant houseplants thanks to their rhizomatous roots that store water. ZZ Plants may be one of the hardiest and most forgiving houseplants recommendable today LIGHTING REQUIREMENTS: ZZ HousePlants do well in low light or bright indirect light. Since a Zamioculcas zamiifolia is a slow growing plant even in good light, in low light a ZZ Plant rarely produces new leaves. Direct sun burns the leaves of a ZZ Plant. CARE INSTRUCTIONS WATER: Over-watering is the only way to kill Zamioculcas zamiifolia houseplants. ZZ houseplants do not like wet feet so allow the soil to thoroughly dry out before watering. ZZ Plants have thick roots called rhizomes that store water so when in doubt, do not water. Unlike most plants, Zamioculcas are very forgiving plants, allowing you to over-water a few times before showing signs of serious damage. Yellow leaves on a ZZ Plant are an indication that the plant has been over-watered. FERTILIZER: Feed a Zamioculcas every other month with a basic houseplant food at 1/2 the recommended strength. Feed only when the ZZ plant is actively growing. TEMPERATURE: ZZ houseplants prefer temperatures between 60-80 degrees. Temperatures below 60 hinder growth on a Zamioculcas zamiifolia. HUMIDITY: ZZ houseplants do well in basic household humidity. PESTS: Zamioculcas zamiifolia are resistant to most plant pests. DISEASES: ZZ Plants are resistant to most plant plant diseases. SOIL: Use a well -aerated soil that retains water but drains well for ZZ Houseplants. Add sand if the soil of a ZZ Plant becomes too heavy and compact. 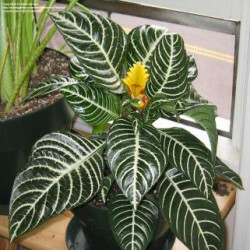 Zebra HousePlants (Aphelandra squarrosa) has spectacular foliage and exotic looking flowers. The nickname Zebra Plant comes from its large, dark green, shiny leaves that have a bold white midrib and white veins. The stems of the leaves of Zebra HousePlants have a purple tinge. The bright yellow flowers on a Zebra Plant emerge from bracts at the end of a long stem. A Zebra Plant, native to the Brazilian forests, is primarily a table plant that stands about a foot tall. 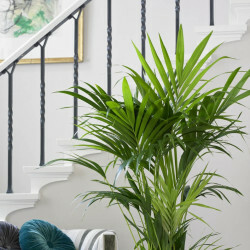 Zebra Houseplants do require a little extra care; but this beautiful, out of the ordinary houseplant, is well worth it. LIGHTING REQUIREMENTS: Zebra Plants requires very bright indirect light but no direct sun. CARE INSTRUCTIONS WATER: Keep the soil of a Zebra Plant moist but not soggy; never allow the soil to totally dry out. Bottom leaves drop off a Zebra Plant if it is over or under-watered. FERTILIZER: Feed a Zebra Plant weekly in the spring and summer with a basic houseplant food at 1/2 the recommended strength. TEMPERATURE: Zebra Plants prefer temperatures between 65-75 degrees. Prolonged exposure to temperatures below 60 degrees causes leaves to fall off a Zebra Plant. HUMIDITY: Zebra Plants, native to the jungles of Brazil, like very high humidity. Place a Zebra Plant on a tray of wet pebbles to help increase the moisture in the air around it. FLOWERING: A Zebra Plant produces flowers from a four sided yellow spike made up of overlapping bracts. The yellow flowers only last a few days, but the attractive bracts of a Zebra Plant last for a month or two. Once the bright yellow bract of a Zebra Plant fades, remove the entire spike. PESTS: Though somewhat pest resistant, whitefly, Mealy Bugs, Aphids, scale, and spider mites may all be a problem for a Zebra Plant. These houseplants pests can all be treated with the green solution, but avoid spraying the flowers on a Zebra Plant. DISEASES: The high humidity that a Zebra Plant prefers encourages Fungal Leaf Spot Plant Disease. Try to keep the leaves dry and provide good air circulation around a Zebra Plant to prevent Leaf Spot Disease. SOIL: Zebra Plants grow well in a fast- draining, highly organic potting soil such as an African Violet mix. The spineless Yucca Plant, a native of Guatemala and southeast Mexico, is an ideal easy care houseplant. Yucca Plants can be a bush or a stalk plant. The long, leathery, pointed leaves of a Yucca Plant are a foot or more in length and about an inch wide. Yucca Plants are very top heavy plants and should always be set into a heavy clay or ceramic pot to prevent them from toppling over. A Yucca is a plant that complements a Southwestern look in your home or office. LIGHTING REQUIREMENTS: Yucca Plants grow best in bright indirect light. A Yucca Plant will survive in lower light but will require very little water. The slow growing Yucca Plant will be even slower to produce new leaves in low to medium light. An ideal location for a Yucca Plant is near a west, east, or south-facing window. CARE INSTRUCTIONS WATER: A Yucca Plant originates in the deserts of Mexico and Guatemala so it likes to be kept dry. Allow at least the top 50% of the soil of a Yucca Plant to dry out before watering. Too much water is the main and probably the only way to kill a Yucca Plant. FERTILIZER: Feed a Yucca Plant monthly in the spring and summer with a basic houseplant food at 1/2 the recommended strength. TEMPERATURE: A Yucca Plantcan adapt to temperatures as low as 35 degrees and as high as 90 degrees. HUMIDITY: Yucca Plants do well in basic household humidity. PESTS: The usual household plant pests rarely bother a Yucca; even spider mites avoid this plant. If you do notice Mealy Bugs or scale on a Yucca Plant, spray with the green solution (recipe in Glossary). SOIL: Use a good quality, well-aerated, loose houseplant soil that drains quickly for a Yucca Plant. Add sand to the soil if it seems too heavy or clay-like. Norfolk Island Pine Trees, sometimes simply called Star Pines, are stately symmetrical evergreens that thrive indoors in very bright light. Many people use Norfolk Pines as living Christmas Trees, but be careful not to dry them out with too many lights. Norfolk Pines come small enough to sit on a table and large enough to fill the corner of a large room with tall ceilings. When purchasing a Norfolk Pine as a houseplant be sure that the plant has multiple trunks. This prevents the star Pine from looking bare and skinny as it grows taller. 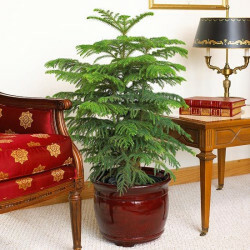 Keep in mind, you can’t trim a Norfolk Pine or make it shorter without the tree losing its symmetrical shape. LIGHTING REQUIREMENTS: Norfolk Island Pine Trees require very bright light, even some direct sun. Bottom branches fall off when a Norfolk Island Pine doesn't get enough light. CARE INSTRUCTIONS WATER: Keep the soil of a Norfolk Island Pine Tree moist at all times. Yellow needles on a Norfolk Island Pine can indicate that the soil is too wet or too dry. If the soil gets completely dry, entire fronds turn gray and brittle. FERTILIZER: Feed a Norfolk Island Pine Tree every other week in the spring, summer,and fall. Use a well balanced liquid plant fertilizer diluted ti 1/2 the recommended strength. TEMPERATURE: Norfolk Island Pine Trees prefer temperatures between 60-75°F, 16-24°C. HUMIDITY: High humidity is important for a Norfolk Island Pine Tree. Dry air causes the needles on the tree to fall off. Keep a Norfolk Island Pine away from cold drafts, air conditioning vents, heating vents. PESTS: The main houseplant pest that bothers a Norfolk Island Pine is Mealy Bugs. You can recognize the problem by the white, sticky, cottony, residue left on the plant. SOIL: Use a good potting soil that retains moisture for a Norfolk Island Pine Tree. Moses in the Cradle HousePlants, Tradescantia spathacea, (alternative names include: Moses-in-a-Boat, Boat Lily, Cradle Lily, Moses-in-the-Bullrushes, Oyster Plant, Rhoeo discolor) are attractive easy care houseplants native to Mexico, the West Indies, and Central America. Moses In the Cradle HousePlants produce rosettes of long ,waxy, sword-shaped leaves that are glossy green on top and a rich purple on the under side. The very small three petaled white flowers of Moses-in-the-Cradle HousePlants are tucked away in a purple boat shaped bract in the leaf axil. This gives Moses-in-the-Cradle Houseplants their many common names. Treat Moses-in-the-Cradle HousePlants as you would Succulent Plants and it will grow beautifully. LIGHTING REQUIREMENTS: Moses in the Cradle Houseplants like very bright light for at least 6-8 hours a day. CARE INSTRUCTIONS WATER: Allow the top inch or two of soil in Moses in the Cradle Houseplants to dry out before watering. Keep the soil of Moses in the Cradle Plants drier during the winter when house plants are not actively growing. FERTILIZER: Feed Moses in the Cradle HousePlants monthly in the spring and summer with a well- balanced plant food at 1/2 the recommended strength. TEMPERATURE: 60-85 degrees (16-19C) is the best temperature for Moses-in-the- Cradle HousePlants. Moses in the Cradle Plants, or Oyster Plants as they are sometimes called, like to be a little cooler at night. HUMIDITY: Moses in the Cradle HousePlants prefer medium to high humidity. FLOWERING: Moses in the Cradle HousePlants produces small inconsequential three pedaled white flowers. PESTS: spider mites and Mealy Bugs are the two main houseplant pests that may infest Moses in the Cradle Houseplants. DISEASES: Because Moses in Cradle HousePlants like high humidity, root rot and leaf spot are two houseplant diseases that affect the plant. SOIL: Use a good potting soil for Moses in the Cradle Houseplants that retains moisture yet drains quickly. The Pachira aquatica (Money Tree) originally came from the wetlands in Central and South America and became very popular in Taiwan in the 1980’s. Today, the Money Tree is available throughout the world especially in the bonsai form. This fascinating plant has a central trunk made of three, five, or more stems that are often braided together. The top of the Money Tree has the “lucky” 5 lobed leaf arrangement. 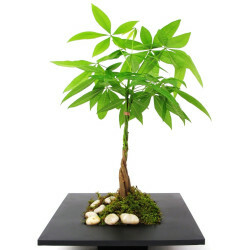 When small, a Money Tree can be trained as a bonsai or used as a table plant. As the plant matures, it makes an impressive tree often reaching a height of six feet or more. Other plants like pothos and jade are sometimes referred to as Money Plants, but the Pachira aquatica is the variety used by the followers of Feng Shui. They believe that a Pachira aquatica plant, when properly placed in a home or business, brings prosperity and good fortune. LIGHTING REQUIREMENTS: A Money Tree grows best in medium to bright indirect light. This plant even does well under fluorescent lights. CARE INSTRUCTIONS WATER: Water a Money Tree well and then allow the top 1"- 2" of soil to dry out before watering again. A Pachira aquatica requires less water during the winter months. Be sure to use a container with bottom drip holes to prevent over watering and root rot in a Money Tree Plant. FERTILIZER: Feed a Money Tree monthly in the spring and summer when it is actively producing new leaves. Use a basic household plant food at 1/2 the recommended strength. Fertilize a Pachira aquatica every other month in the fall and winter if new leaves appear. TEMPERATURE: A Money Tree prefers temperatures between 65-75 degrees F (16-24 degrees C.) HUMIDITY: Pachira aquatica like high humidity. If your home or office is dry, place the Money Tree Plant on a wet pebble tray. PESTS: Pests and diseases rarely bother Pachira aquatica. If the houseplant pests Mealy Bugs or scale appear, use the green solution at 1/2 the recommended strength. SOIL: Use a quick draining potting soil for a Money Tree plant. Add some sand to the mix to help it drain faster. If you have a bright spot in you home or office and want a graceful draping plant that will bloom off and on all year, Lipstick House Plants are a great choice. Although a relative of the somewhat finicky African Violet Plants, Lipstick Plants are very easy indoor flowering houseplants. When given the right amount of light and not too much water, Lipstick Plants produce numerous red or orange small tubular flowers throughout the year. Not only are the flowers of Lipstick HousePlants colorful, the leaves can be light green, dark green, or green and maroon. 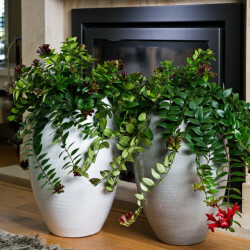 Hang Lipstick Plants from the ceiling, place them in a wall sconce, or sit one on a table, you will love Having a Lipstick Plant as one of your houseplants. LIGHTING REQUIREMENTS: Indoor Lipstick HousePlants require very bright indirect light. Direct sun burns the leaves of Lipstick Plants. CARE INSTRUCTIONS WATER: Lipstick Plants flowers more frequently and more abundantly if you allow the top 25% of the soil dry out before watering. If the leaves of Lipstick HousePlants appear soft and shriveled, give the plant more water. Lipstick Plants lose green leaves when they are over-watered. FERTILIZER: Feed Lipstick House Plants every other week in the spring and summer, and monthly in the fall and winter with a houseplant food high in phosphorous. Always dilute the fertilizer to 1/2 the recommended strength. TEMPERATURE: Lipstick HousePlants like warm temperatures between 75-85 degrees. HUMIDITY: A Lipstick Plant prefers high humidity but does well in basic household humidity. FLOWERING: Indoor Lipstick Plants, when placed in a bright location, produce beautiful, small, reddish orange flowers throughout the year. Stressing Lipstick HousePlants by allowing the soil to dry out often encourages Lipstick Plants to bloom. PESTS: Mealy Bugs, spider mites, Aphids, and thrips are houseplant pests that can attack Lipstick Plants. Examine indoor Lipstick Plants every time you water to catch insect problems early. DISEASES: Lipstick Plants may develop fungal plant diseases because of the high humidity they prefer. SOIL: A basic well-aerated houseplant mix that drains quickly is a good soil for indoor Lipstick Plants. A Kentia Palm is one of the most elegant and expensive palms that can be used in an indoor container. Ranging in size from 4ft. to 12ft. or more, a Kentia is slow growing, durable, and very forgiving. It has long (sometimes several feet in length), graceful, feathery, dark green fronds coming off of a single thin trunk. This stately Palm grows almost anywhere in your home or office. Direct sun, however, burns the leaves. LIGHTING REQUIREMENTS: A Kentia Palm is an indoor plant that can survive in low light conditions but grows better and develops more fronds in medium indirect light CARE INSTRUCTIONS WATER: Water a Kentia Palm well and then allow the top 25% of soil to dry out before watering again. Over-watering, resulting in root-rot, is the major reason Kentias die. Kentia Palms, like most indoor palms, are sensitive to salt, fluoride, and chlorine in the water. Use bottled water if your water has a high chemical concentration. FERTILIZER: A Kentia Palm is a slow growing plant. Fertilize monthly in the spring and summer when the plant is actively growing with a basic houseplant food at 1/2 the recommended strength. TEMPERATURE: Keep the room temperature between 65 and 85 degrees for a Kentia Palm. HUMIDITY: A Kentia Palm does well in basic household humidity. PESTS: Kentia Palms are bothered by the plant pests spider mites and Mealy Bugs. Since Palm fronds are easily damaged, never use anything containing alcohol on them. Use a biodegradable soap solution to treat houseplant pests. If this doesn’t eliminate the plant pests on a Kentia Palm, try an insecticidal soap or Neem Oil. SOIL: Use a well-aerated potting soil that drains quickly but still holds water for a Kentia Palm; add some sand if the soil appears too heavy.